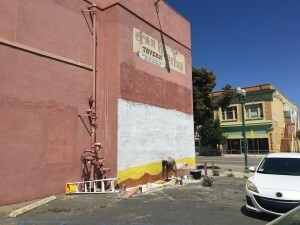 Local artist Ruben Espinoza is working on a new, temporary mural on the side of the former Far Western Tavern building in Guadalupe. The project is a joint effort between the Dunes Center and the Squire Foundation’s Artist in Resident Program, in which Espinoza is enrolled. The building was donated to the Dunes Center as the location for a new museum when the Far Western moved to Orcutt. In May, two murals created by Espinoza were unveiled at Allan Hancock College’s Lompoc campus. His art can also be seen on some utility boxes in Santa Maria.